The SweatPink #1MillionMinutes campaign it rolling along! So far 230,000 minutes have been logged by participants. Way to go everyone! This week SweatPink is partnering up with Grokker. Grokker is an awesome website that provides fitness and cooking videos. I visited the website yesterday and I was amazed at all of the great videos. If you’re interested in the website, make sure you enter this giveaway from TheFitFoodieMama to win a FREE one-year subscription to the website! As always, SweatPink has set up a mad lib below. I’m going to fill out the mad lib below, but make sure to fill out your own and get in on the fun! I’m so excited to rack up more minutes using video workouts from Grokker! There’s everything from Yoga to Cardio for everyone from beginners to advanced, and I’m especially pumped to try HIIT Arms Workout – HIIT Club because it will make me extra sweaty and tone my arms! I plan to do my video workout in my basement before going for a run and after coming home from work. My favorite thing about video workouts is the convenience, and they’re a super convenient way to get sweaty when I am feeling lazy. My goal is to hit 400 minutes this week! I’ll do HIIT Arms Workout – HIIT Club on one of my more intense workout days, and Yoga for Runners – Warm Up Sequence, on a rest or lower intensity day. I challenge all my fellow SweatPink sisters to beat my # of minutes or to do HIIT Arms Workout – HIIT Club with me! Want to get in on all of the fun this week? Follow this week’s daily prompts (shown below) on Instagram. 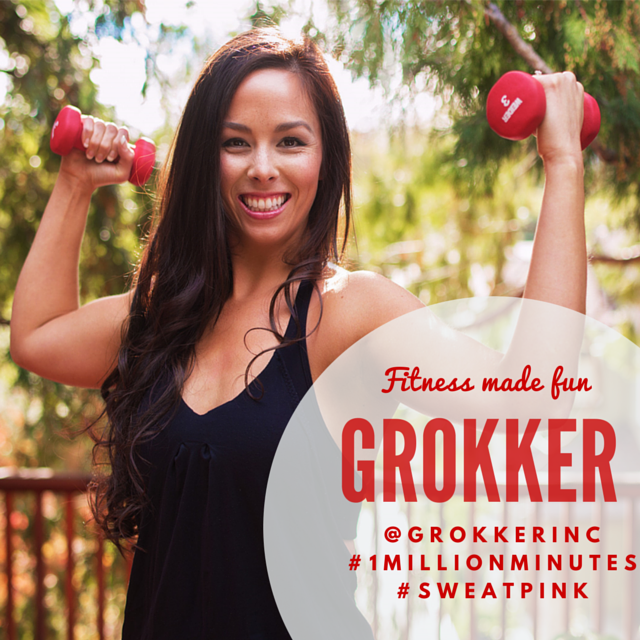 Make sure you tag your posts with @grokkerinc #grokkermillion #1MillionMinutes @fitapproach #sweatpink! No problem – Love to share awesome giveaways! The HIIT arm workout looks great! I can't wait to try it after work today. I didn't know they had cooking videos too! I'll have to go back and check it out! Thanks for the giveaway link! Have a great week! Hi Diane. Thanks for stopping by to read my blog! The cooking videos are awesome!! I've done two videos so far and i love it!